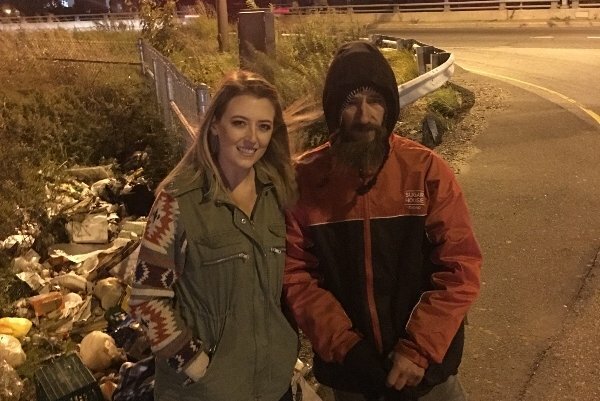 Kate McClure and Johnny Bobbitt, the homeless man who helped her after she got stranded on I-95 in Philadelphia. McClure started a crowdfunding effort that raised more than $400,000 to help the veteran get back on his feet. But now much of the money is reporting missing. A homeless veteran who continues to receive an outpouring of financial support for helping a stranded I-95 driver last month is set to get his own home and that truck he's always wanted. McClure recently posted an update on the GoFundMe page she set up for Johnny Bobbitt after he fetched her an emergency can of gas with his last $20 when she was stranded on the side of I-95 on a drive into Philadelphia. RELATED: How easy is it to use a viral crowdfunding campaign to steal people's money? The fund, which soared to over $387,500 from nearly 14,000 donors as the story went viral in recent weeks, will first be used to buy Bobbitt a new home, McClure wrote in a recent update on the page. "He will never have to worry about a roof over his head again!!" she wrote. Bobbitt is also in line to receive his dream truck – a 1999 Ford Ranger. Two trusts will also be set up in his name – one to help him collect a small earning each year and another that will act as a retirement fund, which will be invested by a financial planner. McClure hopes the second trust will help Bobbitt live his retirement dream of owning a piece of land and a cabin in the country, she said. Bobbitt will also have a new bank account to use for everyday expenses until he finds a job, something he's driven to do, McClure said. Bobbitt also plans to donate to a few organizations and individuals who helped him through a difficult last couple of years. "This is a well thought out plan that Johnny, his lawyer and financial advisor came up with in order to give Johnny the means to acclimate back into a 'normal' life and also to protect him and ensure he has a bright future," McClure wrote. She also said that Bobbitt plans to write a message on the page soon. He finally got that new computer he wanted, McClure said. Bobbitt, a North Carolina native, had reportedly been homeless for a year after moving to Philly for a job that fell through. He served in the U.S. Marine Corps and is a certified paramedic.